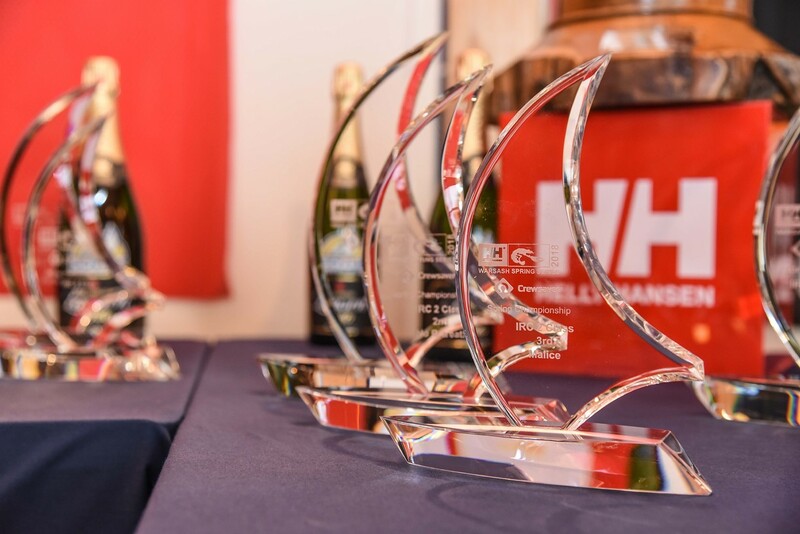 It was a packed prize giving for the 2018 Helly Hansen Warsash Spring Series and Crewsaver Warsash Spring Championship on Friday 18th May at the Warsash Sailing Club (WSC) on the River Hamble. Presenting the awards were Richard Nichols, Marketing Executive at Helly Hansen, Hazel Proudlock from Crewsaver, with Derek Morland, WSC Commodore and Tom Milne from race partners Doyle Sails. In his speech Richard Nichols said: "I would like to say a big thank you to the volunteers at the Warsash Sailing Club for putting on yet another great six weekends of spring racing in the Solent. And to thank you, the competitors, for racing. It has been an excellent Spring series and Championship despite the weather's best attempts to scupper it! We are looking forward to next year's series and to continuing our support as a race partner." The Helly Hansen Trophy, kindly donated by title sponsor Helly Hansen, was awarded to Roger Bowden who in his King 40 Nifty won both the Performance 40 class and IRC1 in the Spring Championship. The Vice Commodore of the Royal Southern Yacht Club, Graham Nixon, accepted to trophy on behalf of Nifty, who couldn't attend the prize giving. The Founder's Salver was awarded to Johnathan Calascione who won the J/70 class in the Spring Championship in his boat Calypso. The salver is awarded to a non-IRC class boat and was presented in memory of Tom Cozens, one of the founders of the Warsash Sailing Club. It is a replica of the salver presented to Tom by all the clubs on the River Hamble. The Warsash Commodores Cup for merit and achievement in an IRC class, was awarded to Chaz Ivill who won the IRC2 class in the Spring Series in his J/112E Davanti Tyres. After receiving his prize Ian Smith Assassin, the IRC2 Spring Championship winner said "It's a fabulous Series, the best organised regatta on the Solent. Slight bias maybe as I am a WSC member but having competed in other regattas around the Solent we love doing this one. We love the competition, we love the challenge it gives us, and we love the fact that we won the Championship this year!" All the podium place class winners were awarded a fine glass yacht trophy, and bottle of champagne courtesy of Doyle Sails. Spring Series class winners were also awarded a Helly Hansen jacket and trousers, courtesy of Helly Hansen, and Spring Championship class winners received two ProFit 180 lifejackets, courtesy of Crewsaver. Date for your diary - the 2019 Helly Hansen Warsash Spring Series will start on 17th March 2019 with the Spring Championship taking place on the last two weekends of April. Peter Bateson Spring Series Chairman "Well done to all the class winners and thank you to everyone for competing. Good sailing for the rest of the season and we hope to see you in the Spring next year." 2018 Helly Hansen Warsash Spring Series class winners: IRC1: Sailplane, IRC2: Davanti Tyres, IRC3: Scarlet Jester, IRC4: Stan the Boat, J/88: J-Dream, J/109: Jiraffe, J/70: DSP, J/80 GBR1305, SB20 Dark & Stormy. 2018 Crewsaver Warsash Championship class winners: IRC1: Nifty, IRC2: Assassin! IRC3: Elaine, IRC4: Whooper, J/109: Jukebox, Quarter Tonner: Bullitt, J/70: Calypso, SB20: Reach Around. You can read the full Series and Championship results at www.warsashspringseries.com.